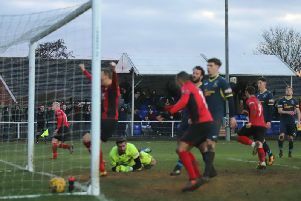 Kettering Town scored another stoppage-time winner on what proved to be another fine day for them in the race for the Evo-Stik League South Premier Division Central title. The Poppies are making every minute count in their quest for the title. There’s a reason why the term ‘Fergie time’ became so well-known in football. It wasn’t anything to do favouritism towards Manchester United. It was because Sir Alex Ferguson drilled into his team the importance of playing until the very end. I’m not sure how many titles United won on the back of late goals but I bet it’s a few. The point is that if you’re going to be a champion then you have to have that ability to keep going right until the bitter end, even if the situation looks hopeless. At this level, you saw it with Hereford last season. And, all of a sudden, we’re seeing it with Kettering Town. The Poppies have picked up 16 points from seven matches since the turn of the year and late goals have contributed towards 10 of them. There was Rhys Hoenes’ winner against AFC Rushden & Diamonds, Aaron O’Connor’s late equaliser in the 2-2 draw at Coalville Town, Tom Knowles’ free-kick at Stourbridge and now Lindon Meikle’s late winner in this one. Take those goals away and 10 points becomes three and the league table looks a lot different to how it does at the moment. Scoring late goals is a good habit to get into and the Poppies may well need a few more before the end of April comes around. The character of the team was summed up in the space of five minutes by Lindon Meikle. This was a day for big characters. 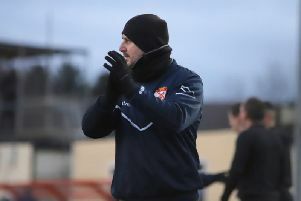 Freezing cold and on a tough surface, you want your big players to stand up and be counted, especially when things might not be going in your favour. With a minute of normal time remaining, the ball was worked to Lindon Meikle on the right side of the area but he scooped his shot over the bar from a good position. I said myself that I thought that was the big chance to win it and I am sure many would have agreed. But, instead of accepting things, the Poppies and Meikle kept going. And once he had skipped past a challenge to work the ball onto his right foot, there was no doubt about where the final shot would go. It was an emphatic finish from a player who doesn’t do tap-ins. But it was a good example to any player to keep going and keep believing even when you think the chance to be the hero may have passed you by. Ben Milnes is underrated by too many. It’s a game of opinions but I thought Ben Milnes was the best player on the pitch. There have been question marks over the midfielder before, not so much for his ability but over whether he can do it when the pitches become harder to play on. He’s a good footballer who would, no doubt, prefer to be playing on surfaces as smooth as a billiard table. But, on a pitch that cut up badly, Milnes showed on this occasion that he is up for the battle. He got stuck into challenges, he used the ball intelligently, he got around the pitch and when Needham Market had one more chance to load the ball into the area after the Poppies had scored what proved to be the winner, Milnes was there to head the danger away. It was a performance that might have gone unnoticed by some but, having been in and out of the team at times, Milnes has made himself a key member of that Kettering midfield. A calculated attempt by the club to get more through the gates seemed to have an effect. On the face of it, an attendance of 762 for a team chasing the title on the back of their most important win of the season so far may not look that big. But it was Kettering’s third highest home attendance of the season on what could well prove to be one of the coldest days of the year. The only other games with higher attendances so far were against AFC Rushden & Diamonds and Tamworth, who obviously both bring with them larger numbers in away support. The club made a calculated effort during the week to ensure a bigger crowd was on hand. Chairman David Mahoney was in touch with the local media to drum up support while Marcus Law added his voice to the same cause. The club were clearly impressed by the support the team received at Stourbridge and wanted to seize on it while things are going well. Smart move. And if the results keep coming and Kettering edge closer to their target then those attendances will only get bigger again as we head towards the finish line. Non-League football doesn’t work without the volunteers. This isn’t something we didn’t already know but it’s always worth reiterating. A sharp frost overnight on Friday ensured this game, like many, was placed in serious doubt. The Poppies were desperate to get it on, no doubt hopeful that a big crowd would be on hand while there would have been great desire to build on the win at Stourbridge. With one of the goalmouths frozen, a call to arms was issued and the volunteers and members of the club’s board delivered. Industrial heaters were brought in and the volunteers were there doing all they could right up until the game was given the green light. You can talk about money, big players etc etc until you’re blue in the face. But volunteers are the heart and soul of non-League clubs and always will be. This was just another great example of it and, in the end, they were rewarded with the result they would have wanted.